TORRANCE, California (April 23, 2018) – MediaMation (MMI) and Hollywood Esports will open a second hybrid-esports theatre at Cinemas Entertainment Lawndale 10 in downtown Chicago to compliment the flagship MX4D Esports Theatre location at the TCL Chinese Theatres in Hollywood, CA. The new MX4D Esports Theatre in Hollywood was designed to convert between “Cinema Mode” and “Esports Mode” in under one hour, allowing cinema operators to enjoy dual revenue streams from MX4D films and then the quick conversion of the theatre to support the specialized needs of esports tournaments and events. “We are honored to be partnering with Cinemas Entertainment to build and operate this leading-edge esports theatre in downtown Chicago,” said Robert K. Laity, CEO of Hollywood Esports. Mr. Henry Leong, President & CEO of Cinemas Entertainment commented, “Cinema owners are exploring new ways to appeal to our customers and as esports continues its rapid expansion in the US, cinemas have a unique ability to host weekly events and tournaments through Hollywood Esports utilizing MediaMation’s innovative esports venue technology. We look forward to offering players, spectators and fans in Chicago a unique and immersive place to enjoy esports events in our new MX4D Esports Theatre.” The Chicago metropolitan area is home to a population of more than 9.5 million people and has a number of highly successful esports organizations and enthusiasts. “This is one of the most advanced and innovative movie theatres I’ve ever seen. It creates an interactive experience that brings the esports content and audience together through the use of motion and special effects. This takes being an esports spectator to the next level,” said Kevin Winston, editor of Digital LA, a well-known technology blogger covering a range of advances in innovation. As spectators and gamers watch a tournament, a “game jockey” animates the entire auditorium with motion and special effects in response to the tournament action on the screen. Spectators enjoy over a dozen special effects that punctuate key points in the game play. Hollywood Esports was launched in 2017 as a joint venture between the TCL Chinese Theatres in Hollywood, MediaMation Inc. in Los Angeles, and Wilshire Consulting in Los Angeles, a consulting firm focused on the start-up and funding of new ventures. For press inquiries, please contact Chris Seide, Hollywood Esports, chris.s@mediamation.com. For over 25 years, MediaMation, Inc. has provided innovative technological solutions to the Cinema and Themed Entertainment market and has expanded to the Esports industry in 2017. 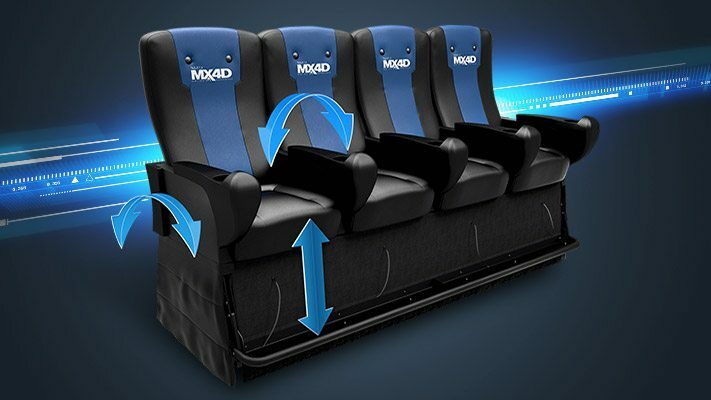 MediaMation is an interactive technology company and a worldwide, leading supplier and manufacturer of patented technology for 4D/5D Motion EFX theatres and seats, including its MX4D® Motion EFX technology, with over 300 installations worldwide. MediaMation also designs and implements turnkey creative solutions for complex shows, rides, exhibits, fountain shows, etc. for theme parks, zoos, aquariums, museums, cinemas and FECs. For more information, visit www.MX-4D.com, follow @MediaMationMX4D on Twitter or MediaMation, Inc. on LinkedIn. For press inquiries, contact Brian Szaks, MediaMation,Inc., brian.s@mediamation.com. Cinemas Entertainment Lawndale 10 is one of downtown Chicago’s most popular and innovative movie theatre complexes, hosting a number of events and alternative content offerings in addition to the latest movies. Cinemas Entertainment continuously strives to bring leading edge and state-of-the-art technology and entertainment offerings to its customers. The TCL Chinese Theatres, the iconic movie palace opened in 1927 by Sid Grauman, is celebrating its 90th birthday last year. Best known for movie premieres, red carpet events and handprint/footprint ceremonies, the TCL Chinese Theatres has long been at the center of Hollywood and remains the beloved movie theatre for many Hollywood celebrities. The TCL Chinese Theatres has built a MediaMation MX4D Esports Theatre to host tournaments and events in the first ever immersive motion and effects esports theatre of its kind. For more information, visit www.tclchinesetheatres.com.